The South Dakota flag has a simple design that is evocative of the sky that stretches out over the state. It also includes symbols of the state and its people to create a flag that represents both the natural world and the people who live within it. 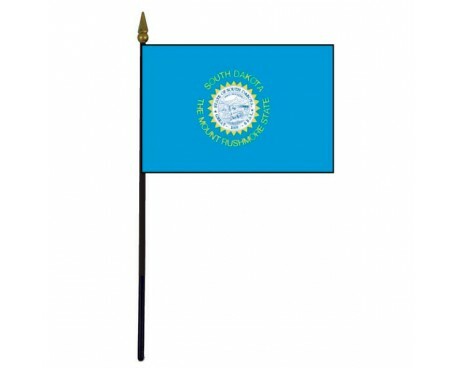 South Dakota state flags have a sky blue field with a golden sun in the center. The sun contains a depiction of the state's seal in white and navy blue. "South Dakota" is written around the top of the sun, and "The Mount Rushmore State" is written along the bottom of it. The sun was chosen to reflect the bright sunlight that shines down on South Dakota, while the blue field was chosen to be reminiscent of the sky around the sun. 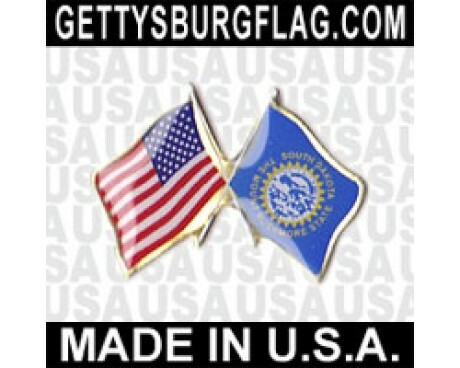 The seal on the flag of South Dakota is a symbol of the state. It shows a boat traveling down a river between a mine and a farmer who is plowing his field. It reflects the industries that dominated the economy of South Dakota during the early part of its development, from agriculture to industry and shipping. 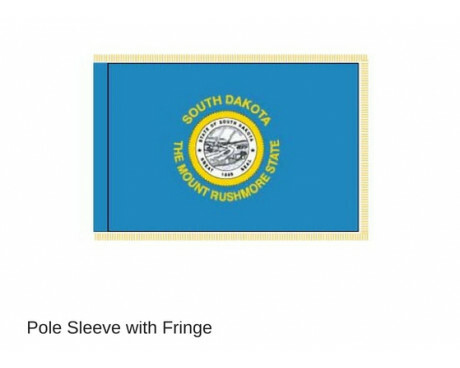 South Dakota state flags date back to 1909, but the original design was not the same as that of the current flag. 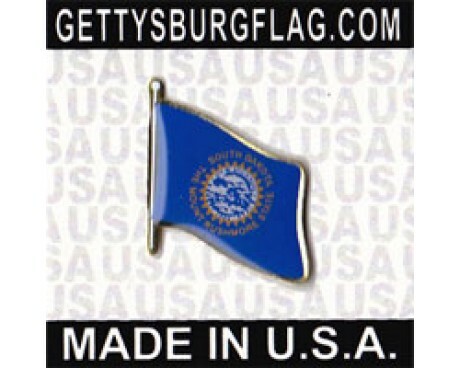 The 1909 flag was designed by Ida Anding at the request of Seth Bullock, a U.S. Marshal. 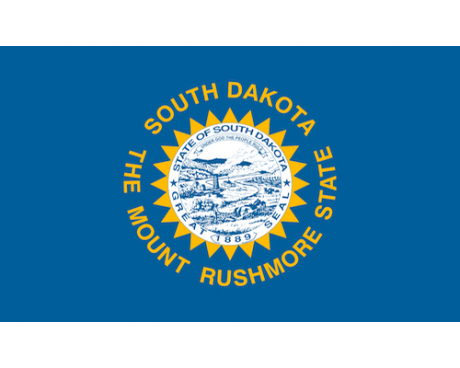 Ida Anding's design for the flag of South Dakota included a different sun emblem than the modern flag and did not include the state's seal. It also referred to South Dakota as "the Sunshine State" rather than "the Mount Rushmore State." 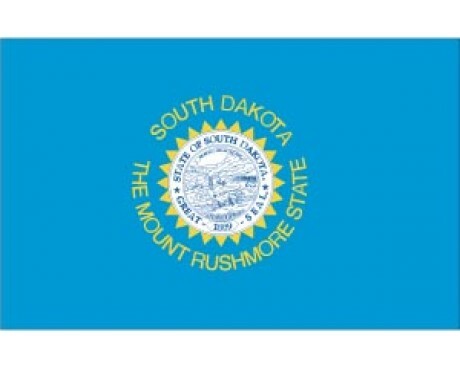 The South Dakota flag was changed to include the state's seal in 1963, and the sky blue field was replaced with a darker shade of blue at the same time. The changes created a flag that bore a much stronger resemblance to the other state flags than the previous design. The sky blue field returned to the flag in 1992, and the flag was changed to refer to "The Mount Rushmore State" at the same time. A later effort to change the flag's design failed in 2012, and no further efforts to change the flag's design have been attempted since then. The state seal which now appears on the obverse (front) of the flag was on the reverse (back) until 1963. From 1909 the obverse had been a large golden sun with lettering around it as on the current version, and the seal appeared on the reverse in blue stitching. Commonsense and economics eventually led to their being combined, and on march 11, 1963 legislation saw the seal being placed within the sun symbol, with the same design on both sides of the flag. The flag of 1909 had been designed by Senator Ernest May together with Mr. Doane Robinson who had followed his father as Secretary of the State Historical Society. The band which carries the lettering around the state seal can be either white, or sky-blue to match the 1963 legislation. The seal itself is yet another allegorical picture, and mainly depicts the agricultural nature of the state. The state motto appears on a scroll at the top of the seal, and the date at the foot of the surrounding band is that of statehood, which was achieved on the same date as neighboring North Dakota. The flag was adopted on march 8, 1909. 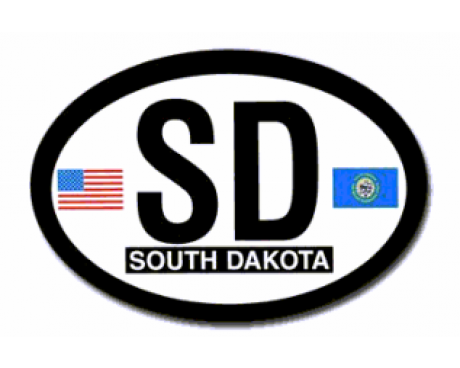 South Dakota part of Dakota Territory from 1861, and became a state on November 2, 1889. This was the same day as North Dakota. It had been part of French Louisiana. South Dakota was settled from 1857 and onward, as part of Missouri Territory, especially after the Homestead Act of 1863, and the gold strike of 1874.